Identify 3-phase electrical and motor mechanical static and dynamic power behaviors. Built on 12-bit resolution HD4096 oscilloscope platforms (with up to 8 input channels) for power section and embedded control debug - complete test capability. Numeric table displaying mean voltage, current, power, etc. values for short time periods with constant load, speed and torque operating conditions - just like what a dedicated power analyzer instrument provides. Long time period (seconds) captures with per-cycle Statistics, per-cycle (synthesized) Waveforms, and Zoom+Gate of waveforms and values to understanding drive and control behavior under changing load, speed, and torque operating conditions - unlike anything you've ever seen before. 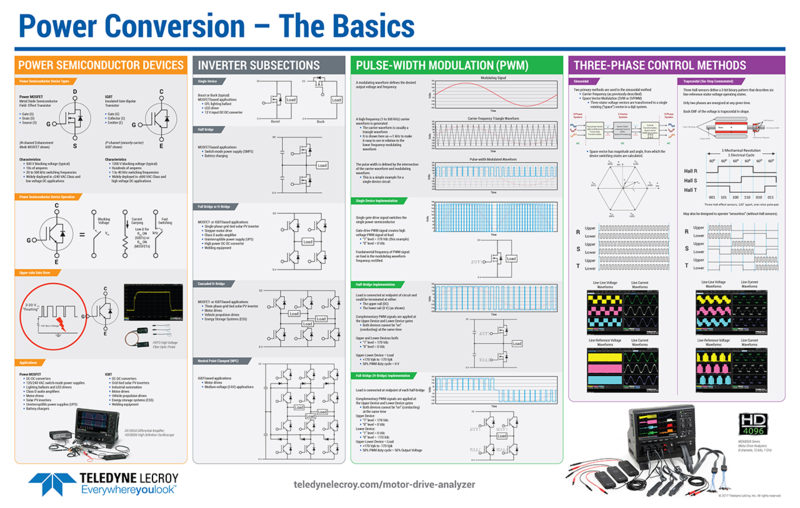 Complete and comprehensive test coverage, including acquisition and display of analog, digital and serial embedded control system signals with correlation of control activity to analog power waveforms and calculated power values and Waveforms. The Teledyne LeCroy Motor Drive Analyzer is ideal for measuring dynamic (transient) losses to enable better understanding of motor and drive efficiencies during real-world operation. Additionally, the Motor Drive Analyzer derives the core and copper loss components using known motor constants and compares them to engineering models and the drive-control feedback circuit. The Teledyne LeCroy Motor Drive Analyzer is ideal for measuring dynamic (transient) losses to enable better understanding of motor and drive efficiencies during real-world operation. Additionally, the Motor Drive Analyzer derives the core and copper loss components using known motor constants and compares them to engineering models and the drive control feedback circuit. The accuracy of the measurements is sufficient to permit comparisons of different drive control and motor types. 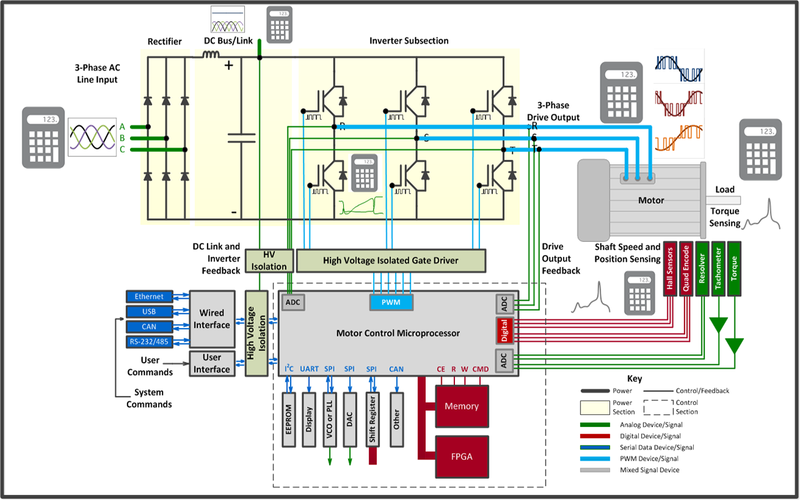 Variable frequency motor drives provide enormous operational and control benefits, but their ability to dynamically control a motor requires equivalent dynamic analysis capability for validation and debug during research and development. The Teledyne LeCroy Motor Drive Analyzer (MDA) dynamically measures per-cycle power and harmonic distortion values, plots them as Waveforms, and permits easy correlation of these values to drive AC input waveforms. Complex industrial machines use motor drives to add precision to industrial processes. Understanding the complete motor and drive electrical operation on a per-phase basis can aid in understanding how the motor and drive react as load conditions change, such as in this cylindrical grinding machine from Fritz Studer AG. Digital encoders, such as QEIs, provide motor shaft speed and angle feedback to motor drive control systems. The MDA can easily interpret these signals and convert them to speed and angle values that can be used for calculation of mechanical power, for comparison to a reference speed feedback signal, or for comparison to other control and power signals. Motors with more than three-phases suit applications calling for redundancy and high reliability. The MDA captures voltage and current signals from both winding sets, measures total static and dynamic power consumption, and calculates balance amongst the two winding sets. More than 90% of motor and motor-drive designs involve small, low-power motors and drives used in household, commercial, or light industrial applications. Such motors need not meet rigorous IEC or NEMA efficiency standards, but engineers still want to measure their designs’ efficiency. The Teledyne LeCroy Motor Drive Analyzer measures drive and motor efficiency at a bench without an expensive and/or scarce dynamometer. The Controlled Area Network (CAN) serial data protocol communicates information over a serial bus in automotive and industrial applications. For motor applications, CAN data may contain digitally encoded electric motor shaft speed. The MDA extracts this encoded data, converts it to an analog value, rescales it, and then uses it in the MDA as a source for motor shaft speed. The two-wattmeter method reduces from six to four the number of input channels required to measure power on a three-phase system. 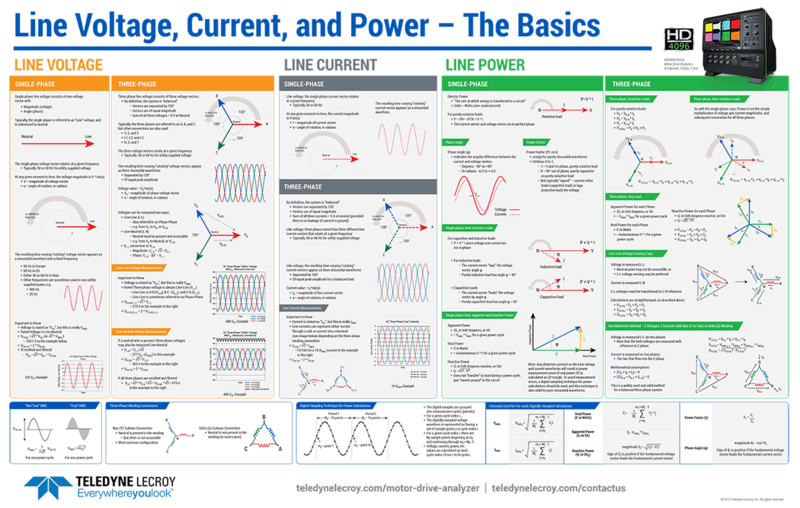 With this method, the calculated power values from each line-line voltage and line-neutral current pair are not in phase or balanced, though the total three-phase power value is correct. However, the Motor Drive Analyzer (MDA) performs a line-to-line to line-neutral conversion and displays accurate and balanced per-phase power values that aid in understanding proper three-phase system operation. Thorough characterization and analysis of an AC induction motor drive requires the ability to view waveforms during dynamic events and to visualize the measurements over time. Whereas traditional power analyzers provide only a static mean measurement capability and, perhaps, viewing of very short waveform acquisitions, Teledyne LeCroy’s MDA810 Motor Drive Analyzer provides static and dynamic power analysis coupled with long acquisition times for comprehensive analysis of the motor drive’s performance and efficiency. Thorough characterization and analysis of a brushless DC motor and its associated drive circuitry requires the ability to view waveforms during dynamic events and to visualize the measurements over time. Whereas traditional power analyzers provide only a static mean measurement capability and, perhaps, viewing of very short waveform acquisitions, Teledyne LeCroy’s MDA810 Motor Drive Analyzer provides static and dynamic power analysis coupled with long acquisition times for comprehensive analysis of the motor/drive’s performance and efficiency. One road to thorough characterization and analysis of a vehicular propulsion motor and its associated drive circuitry involves use of analog torque load cells and analog tachometers to assess drive output to motor-shaft mechanical output efficiency. Whereas traditional power analyzers provide only a static mean measurement capability, Teledyne LeCroy’s MDA810 Motor Drive Analyzer provides static and dynamic power analysis coupled with long acquisition times for comprehensive analysis of the motor/drive’s performance and efficiency. Deadbeat-direct torque and flux control (DB-DTFC) is being explored as an alternative to field-oriented controls (FOC) or direct torque control (DTC) due to its ability to achieve fast torque dynamics, manipulate losses without compromising torque, and utilize full DC bus voltage at voltage-limited operation. Evaluating the Volt-second sensing accuracy requires a precise measurement of Volt-seconds as the reference. Teledyne LeCroy’s MDA810 Motor Drive Analyzer provides such capabilities over each power-semiconductor switching period. Rotors with magnets configured for variable magnetization can minimize losses in a propulsion motor at different rotor speeds and loads. Varying the magnetization requires the motor drive control system to acquire data and make calculations during a very short magnetization period. Teledyne LeCroy’s MDA810 Motor Drive Analyzer acquires and analyzes the controlled energy pulse trajectory to ensure proper operation of the motor drive and control system. Teledyne LeCroy’s Motor Drive Analyzer (MDA) provides three-phase power measurements comparable to a power analyzer using its eight 12-bit input channels. This brief summarizes how to correctly compare Yokogawa’s power analyzer instrument to the MDA, and to explain any differences in measurement results between the two instruments. Motor drive control system debugging often requires the ability to view control and power waveforms concurrently during dynamic events to understand cause and effect relationships, and visualize the dynamic power behaviors over time, correlated to control activity. Traditional Power Analyzers only provide a static (mean value) measurement capability, limited waveform capture, and no support for measuring control system signals. The Teledyne LeCroy MDA810 Motor Drive Analyzer provides static and dynamic power analysis with complete oscilloscope embedded control test capability and correlation of control signals to power events. The CA10 Current Sensor Adapter provides enables a third-party current measurement device to operate like a Teledyne LeCroy probe. This brief explains how to use the CA10 with a Danisense flux gate- based current measurement sensor. Each CA10 setting is described, making it easy to transfer this example to any other current sensor with a voltage output. The CA10 Current Sensor Adapter enables a third-party current measurement device to operate like a Teledyne LeCroy probe. This brief explains how to use the CA10 with a Pearson current measurement sensor. Each CA10 setting will be described, making it easy to transfer this example to any other current sensor with a voltage output. The CA10 Current Sensor Adapter provides the ability for a third-party current measurement device to operate like a Teledyne LeCroy probe. This brief explains how to use the CA10 with a PEM-UK Rogowski Coil. Each CA10 setting is described, making it easy to transfer this example to any other current sensor with a voltage output. The CA10 Current Sensor Adapter enables a third-party current measurement device to operate like a Teledyne LeCroy probe. This brief explains how to use the CA10 with a Murata Power Solutions current transformer. Each CA10 setting will be described, making it easy to transfer this example to any other current transformer. Motor drives utilizing complex control systems (e.g. Vector field-oriented control or FOC) commonly use a resolver interface to provide signals to the control system for calculation of motor shaft speed, angle, and absolute position. The control system requires this information for correct calculation of the required drive output signals. A resolver interface makes debugging and validating drives and control systems much easier when a power analyzer, such as the MDA810, calculates speed, angle, and position directly from the resolver interface and displays them as waveforms.